Born in Philadelphia, Pennsylvania, Robert Garland began his dance training with John Hines at the Philadelphia School for the Performing Arts in North Philadelphia. While there, he studied all forms of dance under the tutelage of a variety of instructors, including John Hines, Marion Cuyjet, Morton Winston, and guest teachers from the Dance Theatre of Harlem company, and the Alvin Ailey American Dance Theater. He also studied at the School for The Pennsylvania Ballet. At fifteen years of age, Robert joined the Philadelphia Dance Company (Philadanco), under the direction of Joan Meyers Brown, as its youngest member. During his tenure with the company, while still in high school, he worked with choreographers Billy Wilson, Talley Beatty and others. It was here that he received his first of George Balanchine’s neo-classical style, through works choreographed for Philadanco by founding members of New York City Ballet William Dollar and Roy Tobias. Upon graduation from high school, he moved to New York City to attend the Juilliard School, where he received his Bachelor of Fine Arts degree in 1983. Through a four-year scholarship, he studied with, and performed works by, choreographers Antony Tudor, Paul Taylor, José Limón, Anna Sokolow, Kazuko Hirabayashi, Alfredo Corvino, and Hector Zaraspe. It was during this time he also performed with Tina Ramirez’s Ballet Hispanico. He has set new and established works for New York City Ballet, Oakland Ballet, and others. He is the first black choreographer to create a work for the Royal Ballet of London. In London, two of his works were chosen by the Telegraph newspaper among the “Top Ten Dance Events” of the London Dance Season. His commercial work has included music videos, commercials and short films, including the children’s television show Sesame Street, a Nike commercial, featuring New York Yankees Derek Jeter, the NAACP Image Awards, a short film for designer Donna Karan, and the “Charmin Cha-Cha” for Procter & Gamble. He has worked for Angelo Ellerbee’s PR firm Double XXposure Firm. A highlight during this time was his work as the personal coach for R&B singer Jaheim for his song and video “Just In Case” from his debut album. It ended up being a platinum success. It has sold over 1,000,000 copies. Garland is a recipient of the Building Brick Award from the New York Chapter of the National Urban League, and is a member of the historic Abyssinian Baptist Church in Harlem, where the Rev. Dr. Calvin O. Butts III is Pastor. For the church Garland choreographed a tribute for Reverend Butts, a one-time only performance for Abyssinian’s White Tie Gala in November 2009, celebrating the church’s 200th Anniversary. From 2004 to 2011, Garland was the Primary Instructor for the Kennedy Center – Dance Theatre of Harlem Residency Program in Washington D.C. Recently he choreographed a work for Misty Copeland, performed by her and her partner Matthew Prescott, appearing at the Vail International Dance Festival, and the Gala of Stars in Cincinnati, Ohio. Garland has also taught for the Alvin Ailey American Dance Theater Company and Ailey II, and recently created a work for the sophomores of the Alvin Ailey\Fordham University Program. 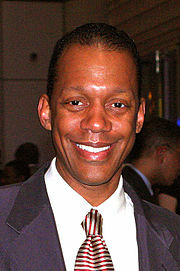 His commercial work has included music videos, commercials and short films, including the children’s television show Sesame Street, a Nike commercial featuring New York Yankee Derek Jeter, the NAACP Image Awards, a short film for designer Donna Karan, and the “Charmin Cha-Cha” for Proctor and Gamble.